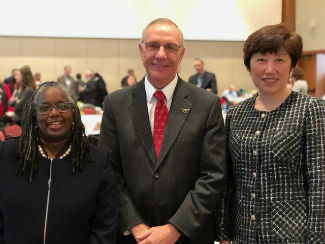 Menah Pratt-Clarke, vice president of strategic affairs and diversity; Cyril Clarke, executive vice president and provost; and Jean Zu, dean of the Charles V. Schaefer, Jr. School of Engineering & Science at the Stevens Institute of Technology, at the annual Advancing Diversity Workshop on Jan. 15. The workshop was attended by close to 400 representatives campus-wide. The event opened with a warm welcome of gratitude and appreciation from Executive Vice President and Provost Cyril Clarke. He acknowledged Menah Pratt-Clarke, vice president of strategic affairs and diversity; her team; and the overall university’s commitment to promoting sustainable transformation at Virginia Tech around inclusion and diversity. “Without a commitment to diversity and inclusion, we cannot hope to create the educational environment within which our graduates can be adequately prepared, truly educated, and ready to join a workforce in a substantive way and with an economic impact,” Clarke said. This year, the workshop awarded certificates to 46 Diversity Allies, 19 Diversity Advocates, and 5 Diversity Ambassadors. In order for the Diversity Allies to earn their awards, they were required to attend three core and three elective workshops for a total of 30 hours. The Diversity Advocates were required to attend two core workshops and four electives for a total of 28 hours. Diversity Ambassadors attended a day-and-a-half onsite workshop and completed an individual project that required at least 20 hours. Total recipients for each award over the years are 429 allies, 201 advocates, and 26 ambassadors. This year’s keynote on inclusive excellence was presented by Jean Zu, dean of the Charles V. Schaefer, Jr. School of Engineering & Science at the Stevens Institute of Technology. Zu shared her personal narrative and expounded on the importance of increasing minority representation and the need to constantly push diversity among faculty and students. Howard Hughes Medical Institute Inclusive Excellence grantees also participated as respondents by providing a description of how they have integrated inclusive excellence within their departments, with the goal of increasing underrepresented and first-generation enrollment in STEM disciplines. Those grantees include Jeannine Eddleton, senior instructor of chemistry; Deborah Good, associate professor of human nutrition, foods, and exercise; and Sarah Karpanty, associate professor of fish and wildlife conservation. One of the highlights of the gathering was a panel discussion on White Men as Full Diversity Partners (WMFDP). The goal of WMFDP is to bring white men wholly on board in diversity efforts and to create candid and respectful teamwork that raises morale and leads to improved productivity and employee engagement. The panelists included David Cox, professor and head, chemical engineering; Sam Easterling, Montague-Betts Professor of Structural Steel Design and chair of the Charles Edward Via Jr. Department of Civil and Environmental Engineering; Jack Lesko, associate dean for research and graduate studies, College of Engineering; and Luke Lester, professor and head of the Bradley Department of Electrical and Computer Engineering in the College of Engineering. The men shared thoughts on being cognizant of diversity and inclusion in order to work across cultural differences and come together to build powerful global organizations. In addition to the thought-provoking panel discussions, a poster exhibit featured the work of 25 faculty members. The posters highlighted local initiatives that advance diversity strategic goals. AdvanceVT, one of the hosts of the workshop, began in 2003 with a grant from the National Science Foundation to promote and enhance the careers of women in academic science and engineering through institutional transformation. Grant funding continued until August 2010. Currently, high-impact initiatives continue with support from university partners and have been expanded to include all faculty in all disciplines. To learn more about upcoming diversity education events please contact Michele Deramo at deramo@vt.edu. If you were not able to attend the workshop, you can view the full video below or by clicking here.